Basil, mozzarella, and tomatoes seem to have been made for one another, so why not put them together in this easy recipe for the pressure cooker. You’ll love how quickly and easily this one-pot pasta dish comes together with so little fuss or mess. In 15 minutes you will have a dish that will have you kids declaring "Mamma Mia!" Feel free to adjust the amount of red pepper flakes according to your desired level of heat and spice. A drizzle of balsamic vinegar is the final flourish that takes this Italian recipe to a whole new level! Heat oil in pressure cooker set to Sauté. Cook and stir onion, garlic, and red pepper flakes in hot oil until fragrant, about 1 minute. Stir penne, tomato sauce, tomatoes, water, half of the basil leaves, and salt with the onion mixture. Cook on High Pressure for 4 minutes. Relieve pressure through quick-release valve. Stir the pasta mixture to oat pasta in sauce; top with mozzarella and balsamic vinegar. Garnish with Parmesan cheese and chopped basil to serve. When describing a recipe as "Caprese" it typically means using the simple Italian ingredients of basil, mozzarella, and tomatoes. These are also the colors of the Italian flag: green, white and red. Per Serving: 709 calories; 35g fat; 69.6g carbohydrates; 33g protein; 77mg cholesterol; 3257mg sodium. 4 minutes under pressure gave me this beautiful dish. I love caprese so much and this recipe is divine! My wife and I love making this pasta caprese in our pressure cooker. It's definitely one of our family favorite weeknight meals. The sauce is classic and simple. I love making pasta in my pressure cooker and this recipe is definitely one of my favorites. The added garlic and onion to the tomato sauce gave this dish excellent flavor, vey delicious. Definitely an interesting take on this style of salad. 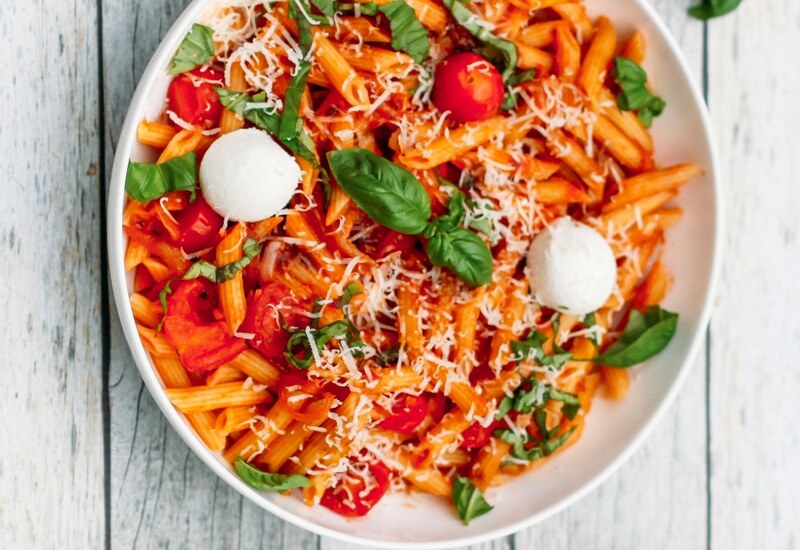 Basil, mozzarella and tomatoes are superb in this pasta. Also added chicken, because why not? First recipe ever made in my MultiPot and definitely won’t be the last. Added lots of red pepper flakes to my bowl. This was super good. I used a whole wheat pasta and paired it with garlic bread. Yum!! So fast. Used fresh “Sweet 100” tomatoes and basil and spinach from the garden. We tried it with the chili flakes and found it to be too spicy for us, so we tried it again and didn’t put any in. Much better the second time around for us. Great fast recipe!